The Game Where Pictures Take Shape! 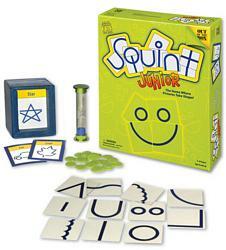 Squint Junior brings the creative fun of Squint to the entire family. The 42 simple Shape Cards are used to build pictures. The 168 Squint Junior Cards show the name of an item and give an example of one way of building the picture.